From juggling to playing bongos, to conducting theoretical physics at strip clubs, Richard Feynman was the physics world’s most colorful figure for a very long time. Richard Feynman is one of the reasons I’m writing this blog as he epitomized scientific discovery and curiosity about nature and the physical world around us. Because of Feynman, I’m searching for other curious characters in his mold. I became acquainted with Feynman through his famous three volume set of books, “The Feynman Lectures on Physics.” The so-called “red books” were the first physics books I owned and I quickly got the feeling that the books were special. I became so enthralled with Feynman I felt the need to visit his old office at Caltech. With some help, I found out his office was located in the Lauritzen lab building at the south end of the Caltech campus. His office was 456 Lauritzen, a nice top-floor corner office with a window overlooking a secluded courtyard with a huge old classic Pasadena oak tree that seemingly stretched its arms high enough to grace the window of Feynman’s office. I remember the first time I paid a visit to his old office, a weekday afternoon. I was filled with anticipation as I sought out his greatness. The office is now occupied by John Schwarz, a professor famous in his own right for helping create the field of string theory. This turn of events is ironic since Feynman thought little of string theory. That day the office door was closed, and the hallway outside was very quiet. The door directly across the hall was open with some graduate students and postdocs intently staring at computer screens. 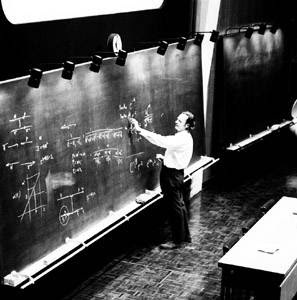 In the hallway adjacent to Feynman’s office is row of low white benches across from a long blackboard. I found it exciting to sit on the bench and ponder over all the stirring theories that grew out of the office just steps away – path integrals, quantum electrodynamics, Feynman diagrams, the first notion of nanotechnology to mention just a few. I sat there assessing what was written on the whiteboard, scribblings no doubt by ground-breaking researchers and Nobel Laureates alike. Fortunately, I had my digital camera along and took a photo to bring home so I could make some sense out of it all. Over the years, I would return to Feynman’s old office every now and again to gain inspiration and take an incremental picture of the blackboard. Are there any other Feynman groupies out there?